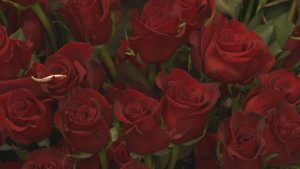 ASHLAND, Ore. – In case you didn’t know Valentine’s day is tomorrow, and that means a lot of businesses are getting ready for a busy day. “It’s a really great time to let people know you care about them and how special they are to you, and it’s a good day for that,” Euphloria Flower Shop Owner, Kelly said. Euphloria Flower Shop in Ashland is already seeing a high number of orders for valentine’s day. “Pretty hectic, we’ll start early they’ll be people picking up orders that they preordered a lot of people wait till the last minute on valentines day to order, but we’re still able to deliver orders tomorrow for people who call tomorrow,” Kelly said. The most popular flowers to sell out, you guessed it, roses and second come lilies, but Kellie says she likes when people think out of the box for their floral arrangements. “This is a hanging heliconia so this is really unusual. So things that’s very unique. Things that people go wow what’s that,” she said. Kelly says they’ll sell over a thousand roses, and no matter who you’re buying for, she says your secrets are safe at Euphloria.